Olive oil and butter = two fats that I always have in the kitchen. I'd say that I reach for the olive oil or butter for the majority of things I make in the kitchen, from baking to sautéeing. Coconut oil comes in a close third. When it comes to deep-frying, I reach for the vegetable oil. Lard and shortening make rare appearance, usually in a pie crust. Corn oil? Hmmm...I'm not really sure. I know I've picked it up in the past. I've used it where I would use vegetable oil - for frying up some tostadas or tortilla strips. I think it may have made its way into a batch or two of brownies or a loaf of bread. But what I never realized was that corn oil is actually high in plant sterols (phytosterols) - it actually has four times more than olive oil and 40 percent more than canola oil. What's so great about that? Well, studies done by the FDA show that when plant sterols are consumed as a part of a diet low in cholesterol and saturated fat, they can help reduce the absorption of cholesterol in the gut, which in turn can lower LDL cholesterol (plant sterols and cholesterol actually compete for absorption by the gut due to their similar structures). It is recommended that we consume between 1,500 and 3,000 mg of plant sterols per day, so adding a heart healthy cooking oil like corn oil is an easy way to get some into your diet. Just one tablespoon of corn oil contains 135 mg of plant sterols. 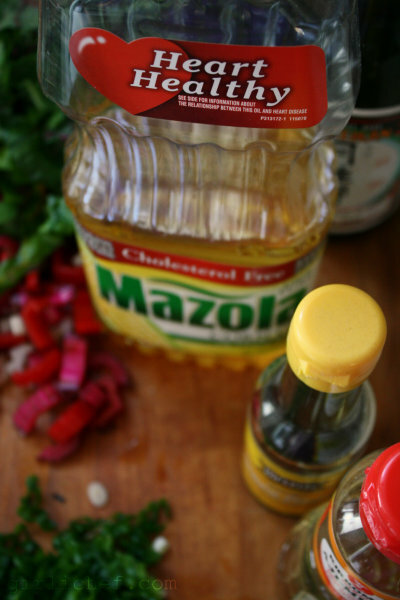 As a way of taking another look at how I cook, Mazola sent me a bottle of their corn oil to use in place of my normal cooking oils during February (since it is National Heart Health Month). And do you know what I found? It worked great, and really, the difference was not noticeable. I will definitely keep a bottle in my kitchen to use in place of vegetable oil from now on (can you say 100 mg high in plant sterols) - say for baking recipes that call for vegetable oil, stir-fries, pan-frying, etc. It won't replace olive oil for uncooked applications or butter for making eggs, omelets, or enriched breads - but it has definitely earned its place among them. This quick, simple stir-fry is a great way to add some plant sterols to your diet by using corn oil as the fat (yes, there's a little sesame oil in there, too - that's for flavor). These greens make a perfect side for fish, or serve as a main dish with some brown rice. Combine soy sauce, sake, mirin, and sesame oil in a small bowl and set aside. Heat a wok or large skillet over high heat. Add corn oil and swirl it around a bit. Add garlic, ginger, scallions, and the pinch of crushed red chile flakes, and cook, stirring constantly for 20-30 seconds. 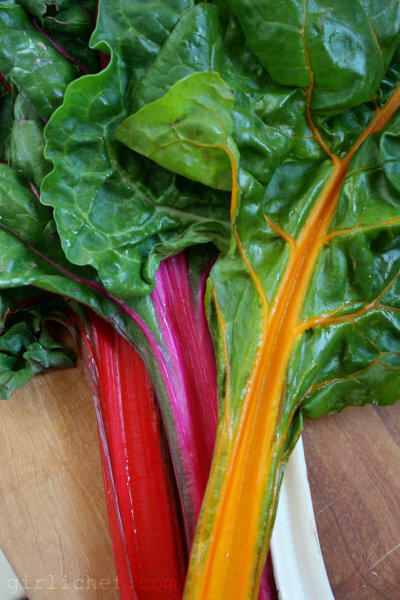 Add the chard ribbons and continue to stir until the leaves are wilted, ~2 minutes. Add pepper, sugar, and the soy sauce mixture. 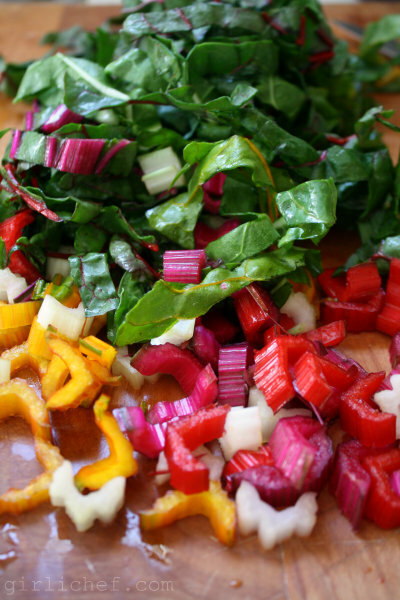 Continue to stir-fry for another 2 minutes or so, until chard is tender. Serve as a side dish or on it's own with some brown rice (or another grain) on the side. 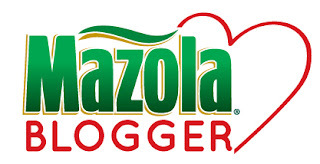 disclosure: I received a free bottle of Mazola Corn Oil for the purpose of testing and taking a new look at corn oil. All opinions stated in this post are my own. I am not a doctor and have no authority to issue diet/medical advice, please consult your physician or nutritionist to work out a diet plan that will fit your lifestyle.